Paris in the late 19th and early 20th century, especially during the periods known as the Belle Époque and les Années Folles, was a hotbed of intellectual and artistic life. During the former, Montmartre was abuzz with cafés, cabarets, and artists’ studios, with a large number of painters including Renoir, Utrillo, Dufy, Picasso, Dalí, Mondrian, Monet, Pissarro, van Gogh, Matisse, Toulouse-Lautrec, and Modigliani associated with the area. After the outbreak of World War I, however, many of the artists left the neighborhood and decamped to the Montparnasse quarter on the left bank. Whereas the artists of Montmartre had associated together more on the basis of status rather than artistic taste, those in Montparnasse were more of an economically and socially homogeneous group, comprised of penniless emigrant artists from around the world who flocked to Montparnasse for the cheap rent and the creative atmosphere, often selling their works to buy enough food to eat and spending hours in the cafés and bars of the area. 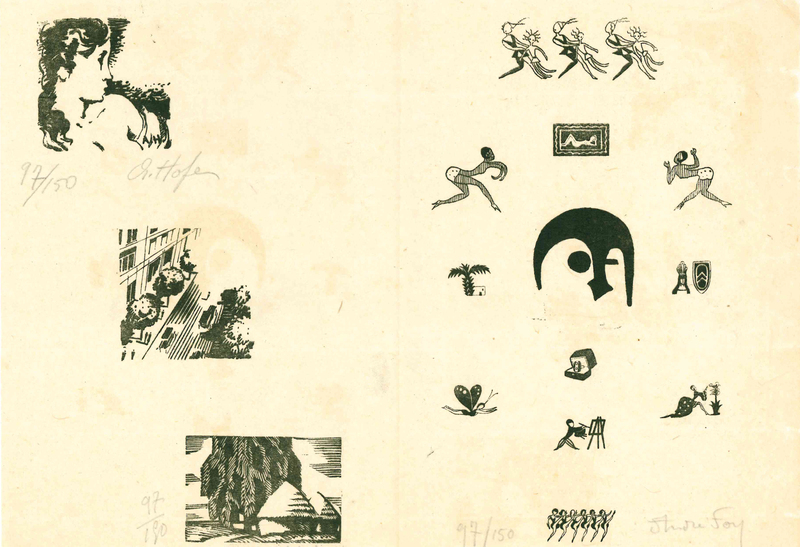 The Montparnasse group included at various times Léger, Picasso, Apollinaire, Cocteau, Chagall, James Joyce, Ernest Hemingway, Modigliani, Ezra Pound, Man Ray, Max Ernst, Duchamp, Gris, Giacometti, Breton, Samuel Beckett, Miró, and many others. Dabbling in cubism, futurism, expressionism, and realism, among other styles, these artists are today often grouped loosely under the “School of Paris” umbrella. “Montmartre, the old popular heart of Paris, invaded by a rabble of merchants, beggars, and moral derelicts, is nothing more to the public mind than a place for the unbridled actions of a few delirious roisterers. We desire to revise this judgment and attempt to restore to the chosen quarters of Toulouse-Lautrec, Degas, Utrillo, its true aspect. Grouped under the banner of the ECOLE DE MONTMARTRE, it is not a puerile picturesque cult which unites us, old alleys, dilapidated houses, sentimental bric-a-bracs, or the effusion of a faded youthfulness which the rhythm of life effaces. The manifesto goes on to denounce commercialism, the circus-like atmosphere some artists have cultivated, and snobbery, while extolling the virtues of honest emotion and human expression, ideas which they hoped to perpetuate and spread through exhibitions, lectures, publications, and by encouraging other artists to form similar groups. 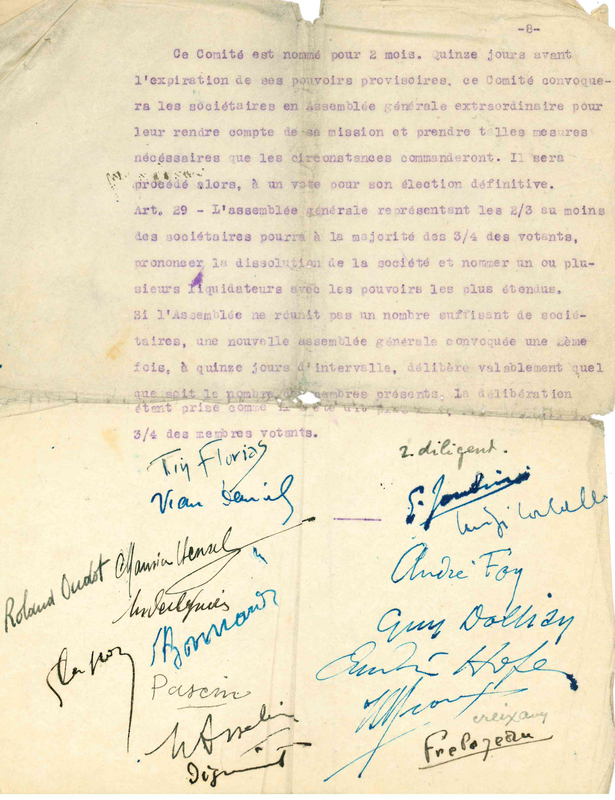 In fact, on the last page of the brief manifesto is a short blurb imploring those who were moved by the document to please send a letter to them at 22, Rue Tourlaque, to be kept abreast of the group’s actions. This archive is an incredible historical record of the activities of the École de Montmartre, from the initial kernel of an idea to the publication of the official manifesto and beyond. Containing well over 100 individual items, from meeting minutes to letters from interested parties addressed to the École to contemporary newspaper clippings, this is a unique collection of original articles that documents an entire artistic movement at a crucial point in Paris’s artistic history. 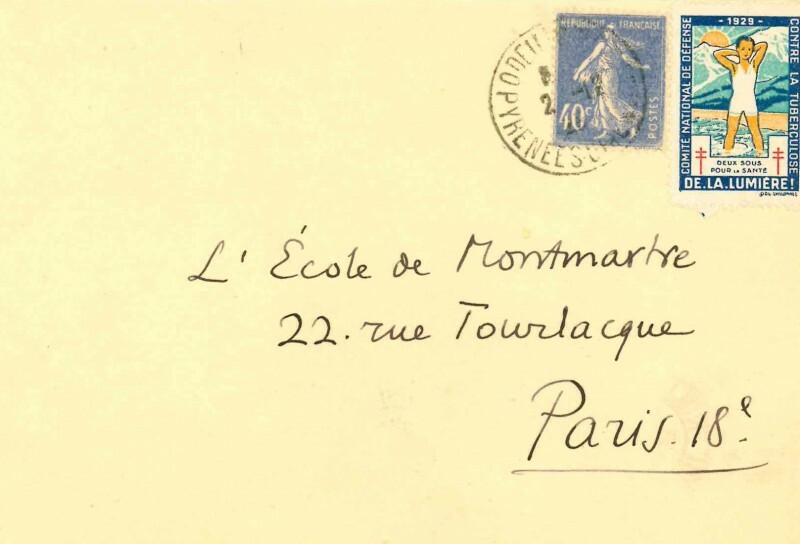 L’École de Montmarte: a significant archive of documents. 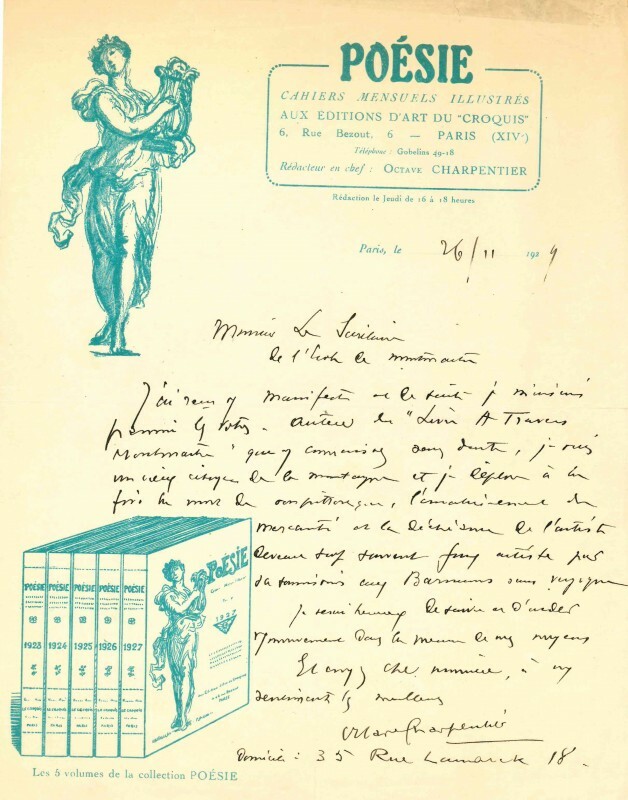 A fantastic and scarce archive of original documents relating to the founding of the École de Montmartre in Paris in 1929, spearheaded by a small group of artists including Georges Joubin, Guy Dollian, Jean Frelezeau, Edouard Hofer, Henri Rioux, and Pierre Bonnard. Various sizes and formats. Loose sheets in a paper folder. Paris circa 1920-1930. – Témoignages: Organe Mensuel de l’Ecole de Montmartre, nos. 1 (October 1930). 2 (November 1930), and 3 (December 1930), 2 copies of each of the first two issues, containing original signed engravings by André Foy, André Hofer, André Deslignières, and Marcel Gimond. – Two typed copies of the “Manifeste de l’École de Montmartre”, dated 1929, 2 pp. each, one bearing the signatures of Jean Puy, André Hofer, Luigi Corbellini, and Pierre Dionisi, the other bearing the signatures of Georges Joubin, the founder of the École de Montmartre, and Charles Camoin. – “Buts de l’Association”, 8 pp. 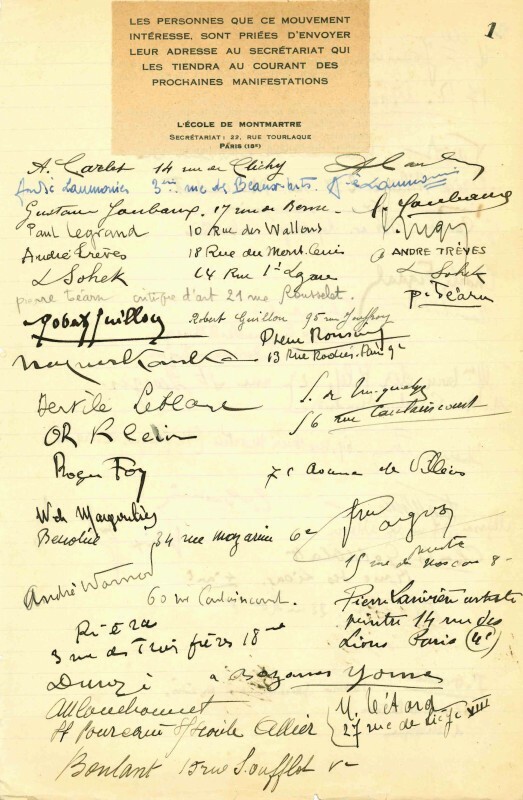 typed, containing a list of the society’s goals, beliefs, and objectives, bearing signatures of approximately 17 artists including Pierre Bonnard, Georges Joubin, André Hofer, André Foy, André Dignimont, Roland Oudot, and Jules Pascin. 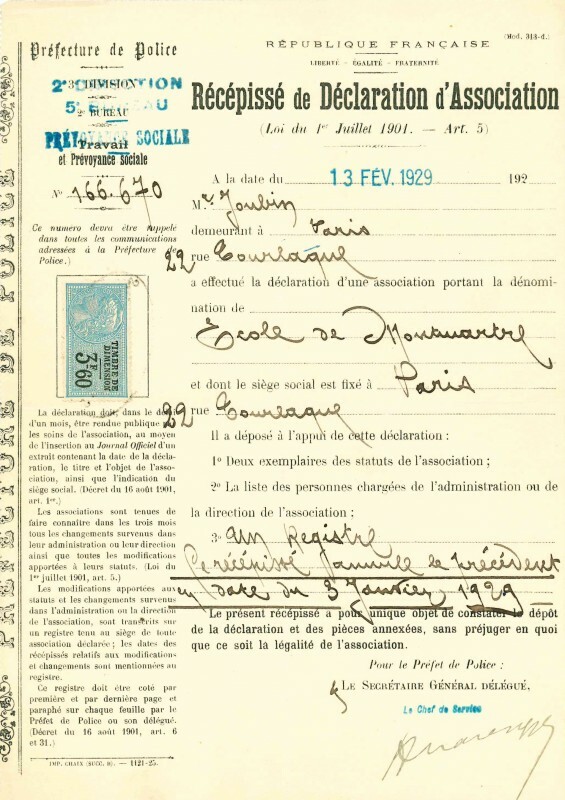 – Official “Récépissé de Déclaration d’Association” issued by the République Française, dated February 13, 1929, establishing the École de Montmartre as an official association. 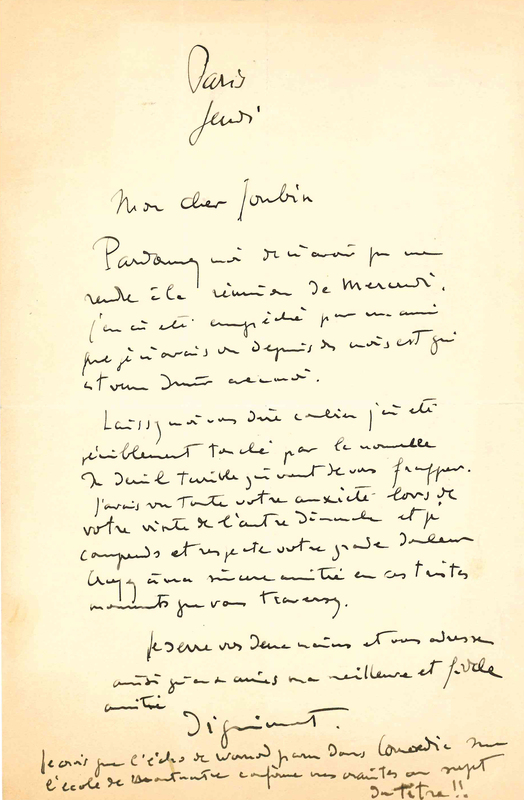 – Minutes from meetings of the École de Montmartre: December 16, 1928 (first meeting) through December 5, 1929, hand-written on a pad of paper. Present at the first meeting, held at the home of Georges Joubin at 22 rue Tourlaque in Paris were 6 artists including Henri Rioux, Jean Frelezeau, Edouard Hofer, Georges Joubin, and Guy Dollian. May 20 and June 17, 1930 are typed. 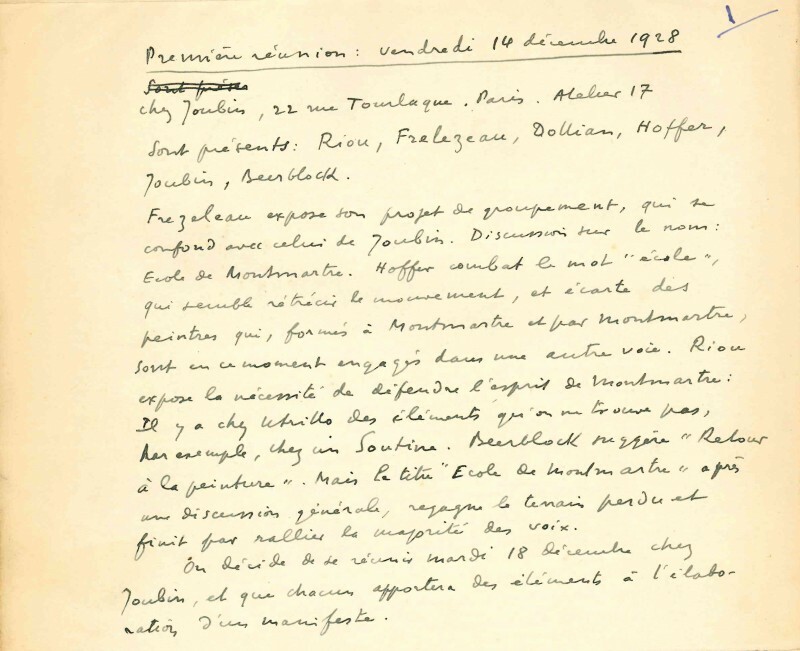 – A group of approximately 19 handwritten letters and notes from affiliated artists regarding the manifesto and the École, including André Foy, Edouard Hofer, André Dignimont, Pere Créixams, Roland Oudot, Carlos Raymond, Charles Chamoin, and Pierre Bonnard. 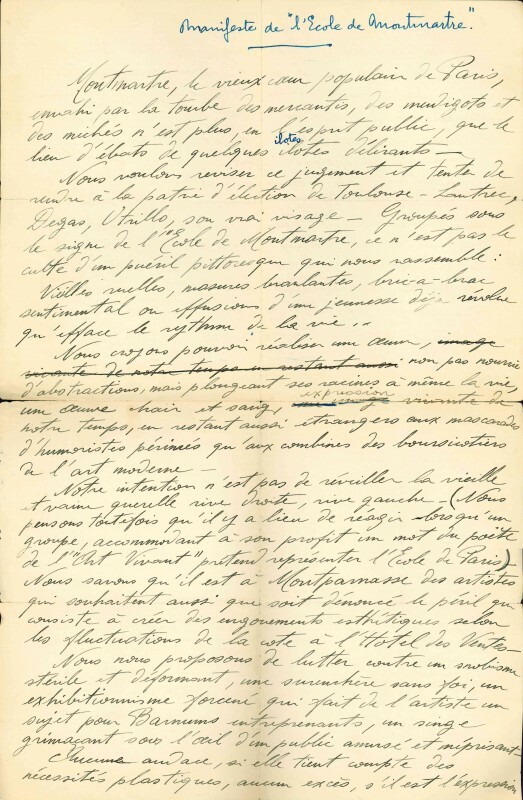 – A group of approximately 39 letters and notes and 11 calling cards from art critics, editors, writers, painters, and other figures in response to the manifesto, typed and hand-written, including Léon Lemonnier, Antonio Coen, Georges Valois, Octave Charpentier, Maurice Fréjacques, André Lebey, Pierre Vorin, Jules Adler, Raymond and Alfred Machard, Eugene L’Hoest, Claude Aveline, Louis Richard, Marc Chesneau, and Jacques Forconi. 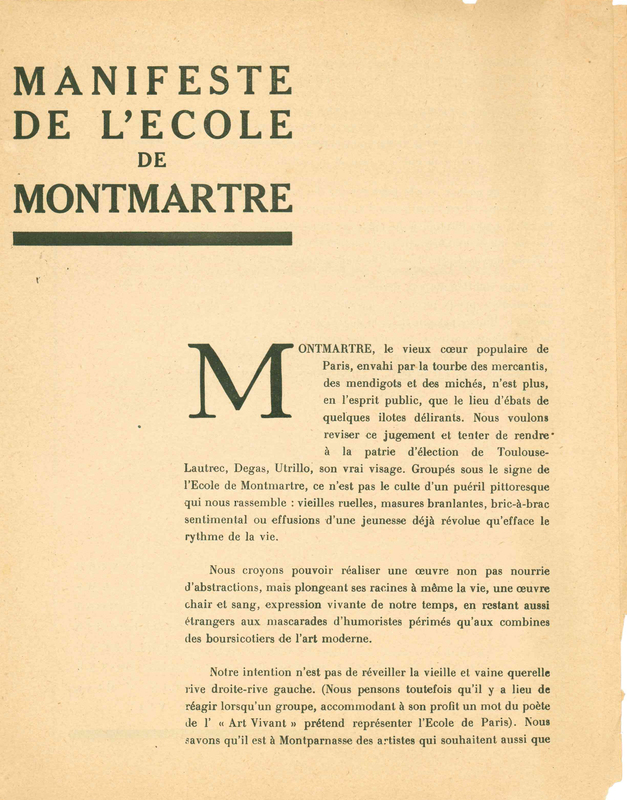 – A collection of approximately 47 contemporary newspaper clippings about the École de Montmartre and its artists, most from 1929, varying in length from short blurbs to longer articles, many with pen notations. 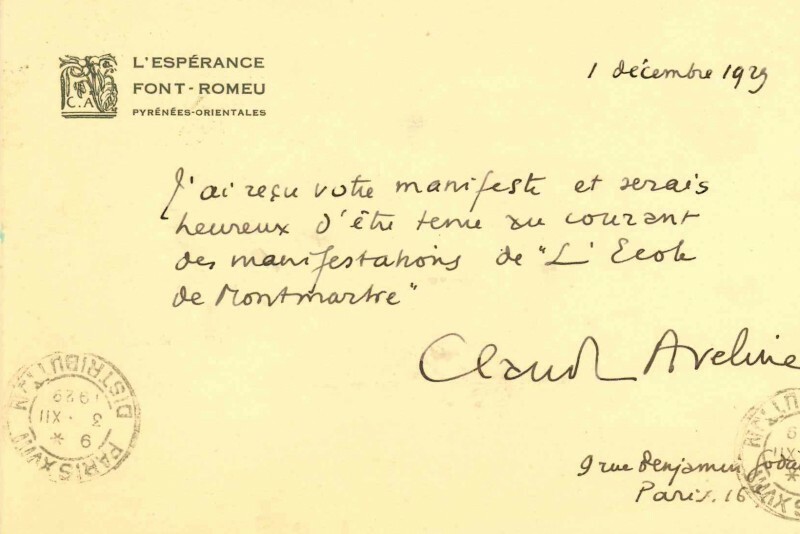 – Two printed copies of the official manifesto, published by Maurice Lavergne, listing the authors as “Asselin, Pierre Bonnard, Corbellini, Creixams, Deslignières, Dignimont, Guy Dollian, Florias Tin, André Foy, Frelezeau, Hensel, André Hofer, Joubin, Pascin, Henri Rioux, Daniel Viau.” One copy is accompanied by three sheets of ruled paper, written on five out of six sides, containing the names, addresses, and signatures of approximately 68 people who were interested in the movement and wanted to be kept apprised of future events. – A typed copy of the manifesto translated into English. – Three hand-written drafts of the manifesto. – Two posters, one in pieces, the other dated December 29, 1922.